Cottages at Harrison Bridge is one of the newer communities in Simpsonville located southwest of Simpsonville, some 20 minutes from downtown Greenville. The subdivision’s proximity to transportation, shopping, restaurants, churches, and other entertainment and sports avenue make it a highly desirable place to live. It has a feel of peaceful country living while enjoying the convenience of a city. Homes for sale in Cottages At Harrison Bridge feature 1 to 2 story ranch/traditional style homes with brick, stone, Hardie Siding siding, stone or brick exterior, 2 car garage, slab foundation, hardwood flooring, ample size bedrooms, and more. Home sizes range from 1381 up to 2383 sq.ft. Home buyers can pick from different floor plans and customized it according to their real estate needs. Amenities in Cottages At Harrison Bridge include community pool, playground, some sidewalks, street lights, and walking trails. Cottages At Harrison Bridge real estate starting price is from $180k up to $280k. Homes in this subdivision are built by Dwelling Group. 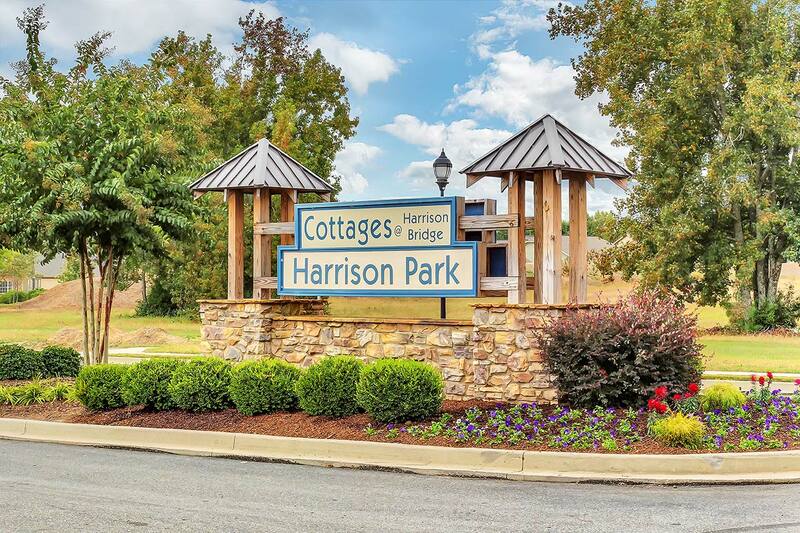 Cottages at Harrison Bridge has easy access to array of shops and restaurants, residents enjoy convenience shopping, dining, and outdoor opportunities. It is one of the popular communities offering new construction homes in Simpsonville. What’s going on nearby Cottages At Harrison Bridge Real Estate? This gated community is located in the highly sought after area of Harrison Bridge Road, Fairview Road, and Fairview Road which provides convenience to shopping, schools, churches, restaurants, doctors, hospital, sports clubs, major roads, and theaters. Downtown Simpsonville is about 3 miles away from Cottages At Harrison Bridge subdivision. That’s few minutes drive from the city amenities and recreation. What schools are assigned to Cottages At Harrison Bridge? If you buy a home for sale in Cottages At Harrison Bridge Subdivision in Simpsonville SC, the local schools serving this community are Fork Shoals Elementary School, Woodmont Middle School, and Woodmont High School. To get more information and other subdivisions and real estate assigned to these schools, please follow the link. Looking for a home in Cottages At Harrison Bridge? If you are interested in the current homes for sale in Cottages At Harrison Bridge Subdivision in Simpsonville SC, below you will find the latest homes available in this community. Our ‘for sale’ property information is a direct feed from the GGAR MLS and is updated multiple times per day. Click on the listing to get more information or you can call us if you have any questions. If you are thinking of selling your home in Cottages At Harrison Bridge. Contact us at 864-881-1352. We, at the J Michael Manley Team, can help you every step of the way. We have a team of experienced listing specialists who have helped many Simpsonville SC home sellers sell their homes for top dollar. Find out what your home in Cottages At Harrison Bridge in Simpsonville, SC is worth. For more information about the Simpsonville – Cottages At Harrison Bridge Real Estate, please contact the J Michael Manley Team at 864-881-1258. Sign up at our website to get the latest homes for sale in Simpsonville. Are you looking for something similar to Cottages At Harrison Bridge real estate? Check out other communities in Simpsonville Real Estate.